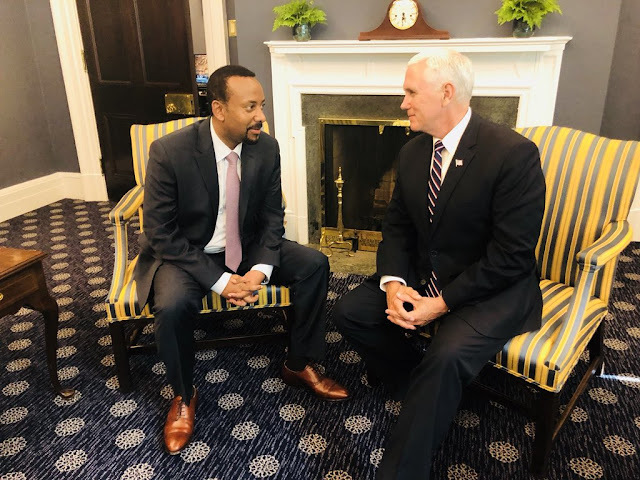 Pence noted Abiy’s efforts at “improving respect for human rights, reforming the business environment, and making peace with Eritrea,” the statement said. “The two leaders underscored their countries’ shared values and their commitment to building an even stronger partnership in the days ahead,” it said. Under Abiy, Ethiopia has instituted reforms including releasing political prisoners, diluting state control of the economy and making peace with northern neighbor Eritrea after two decades of hostility. A 41-year-old former intelligence officer, Abiy came to power after his predecessor resigned earlier this year amid protests against abuses by security forces and public anger over perceived ethnic marginalization of many groups in the racially diverse country. While in Washington Abiy was also scheduled to meet with members of Ethiopia’s large diaspora community in the United States, whose remittances have helped prop up the economy. Abiy is also due to visit Minneapolis and Los Angeles. “I reiterated the IMF’s commitment to work with the Ethiopian authorities to ensure that the economy achieves high rates of sustainable and inclusive growth to reduce poverty,” she said in a statement.